Do you know which kind of learning you are doing? Do you know which kind of learning you’re doing? In 2014 (the same year I took 3 months off and had a baby), I spent over $5,000 on e-learning. 2015? Another $8k. Probably more if you consider the hours and hours I poured thru blogs and articles, researched and read forums, and responded to comments. Since time is money, that adds up. But since I only have the income reports from my accountant to pull the actual numbers, let’s go with $5k. Not an insignificant number, by any means, though I realize that many have spent much, much more. And if you’re anything like me, you might be wondering what I did with a grand total of $13k worth of new information in my brain. Did I use all of it? Did it magically make it’s own investment back in spades? Do I have a textbook case of overwhelm with a side of exhaustion. See, like a hungry college kid at the grocery store, I made a few hasty purchases. I bought a few courses that I was socking away for a rainy day. It was all Just In Case Learning. Just In Case I decide to promote my business on Instagram more. Just In Case my speaking career really takes off. Just In Case there is a better way to set goals than the way I’ve been doing it for years. And while Just In Case Learning may, someday, pay off, it’s actually glorified busy work (and busy work for my bank account too – I’ve yet to see any of my Just In Case Learning pay for itself). 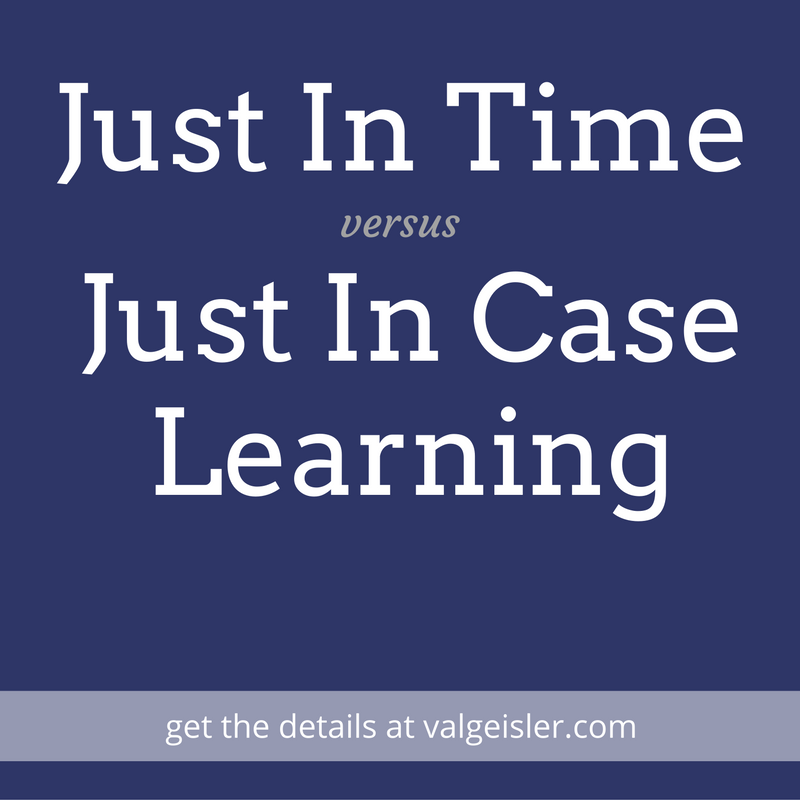 Just In Case Learning is what we do when we don’t know what to do. It’s the liberal arts degree of entrepreneurship. I should know, I have a degree in theatre. I learned about how to properly run Facebook Ads Just In Time before I wasted any more money trying to figure it out myself. I nailed down my messaging with clear and concise copy Just In Time before I launched my new website. I got the inside scoop on rocking a great webinar that sells Just In Time before I launched my big group program. Just In Time Learning is the kind that pays for itself. Maybe not in actual dollars made after the course was over but in dollars saved by not spending them in the first place. Less output, more knowledge. Do I need this information for the next 90 days of my business? Am I willing to put in the leg work (no matter how much) to learn it on my own? Would I like a guide in this information? Someone who has tested it out and honed it for me? And that’s it. If I can answer Yes, No, Yes to those questions, it’s Just In Time Learning that I will happily invest in. No more busywork. No more wasted money. I’ve been the hungry kid at the grocery store (in real life and in business). It’s a drain on my wallet and my sanity and I’ve committed to never going to the store hungry again. Just In Case Learning is so 2015. We’re over halfway thru 2016 (what. I’ll pause while THAT sinks in…) but it’s officially The Year of Just In Time Learning. What’s on your Just In Time Learning list?